I have done my last walk of the year, starting from Burnham-on-Crouch, more or less opposite Canewdon on the north bank of the river Crouch. 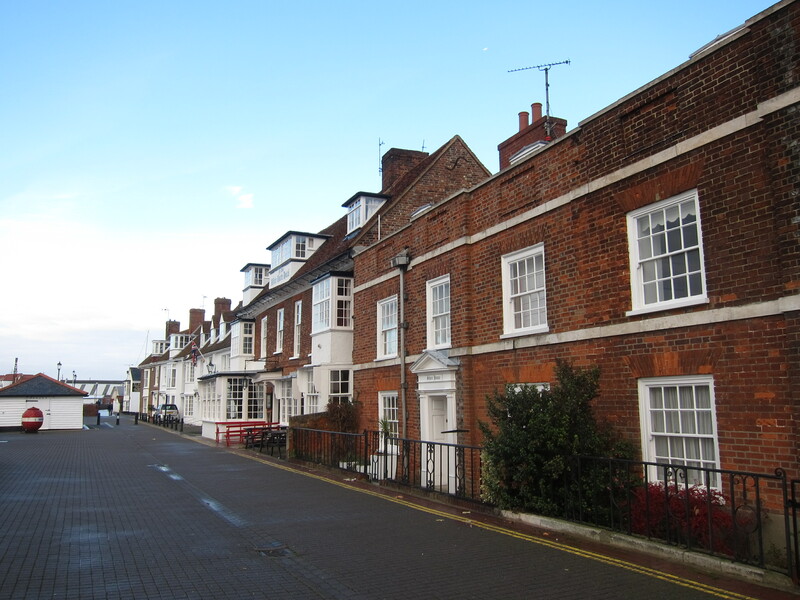 Burnham is an attractive town, with a row of seventeenth century mariners’ houses overlooking the river. They are distinguished by the huge dormer windows, that enabled the waiters at home to see the ships coming up the river in a time when travelling by water up and down the east coast was far easier than travelling by land. Tom joined me again, and gave me the benefit of his encyclopaedic knowledge of the wildfowl which inhabit the salt marshes that line the estuary and stretch along the coast. We saw egrets, pied wagtails, a kestrel, starlings (I spotted those! ), lapwings, which I have learnt have fingered ends to their wings, and lots of brent geese. Tom also spotted a marsh harrier and a barn owl, but they just looked like tiny blobs to me. The weather was kind – a slightly bracing north-east wind, but nothing too cutting. 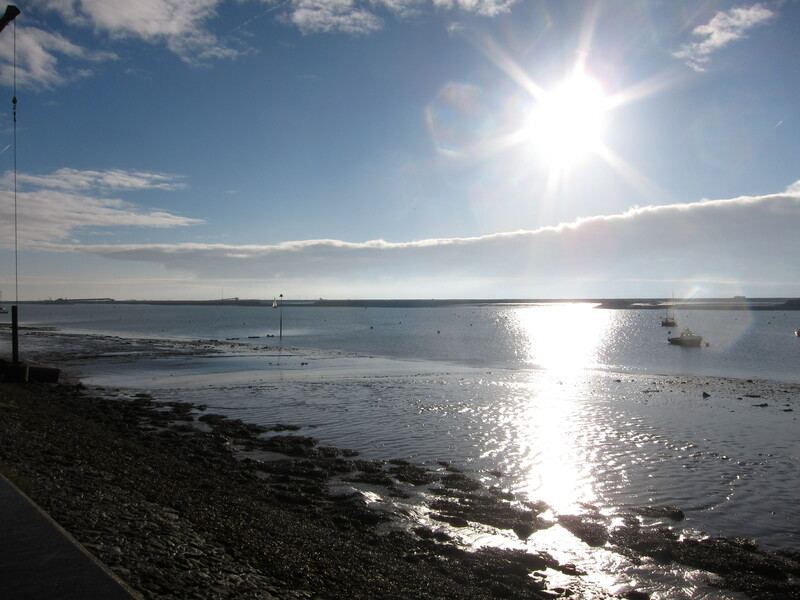 The path continues, as it has since Shoeburyness, as a walk along the embanked sea wall. In a few places the wall has been breached to allow managed flooding and encourage the return of salt marsh. The absolute highlight of the day was the visit to the tiny church of St Peter-ad-Muram. 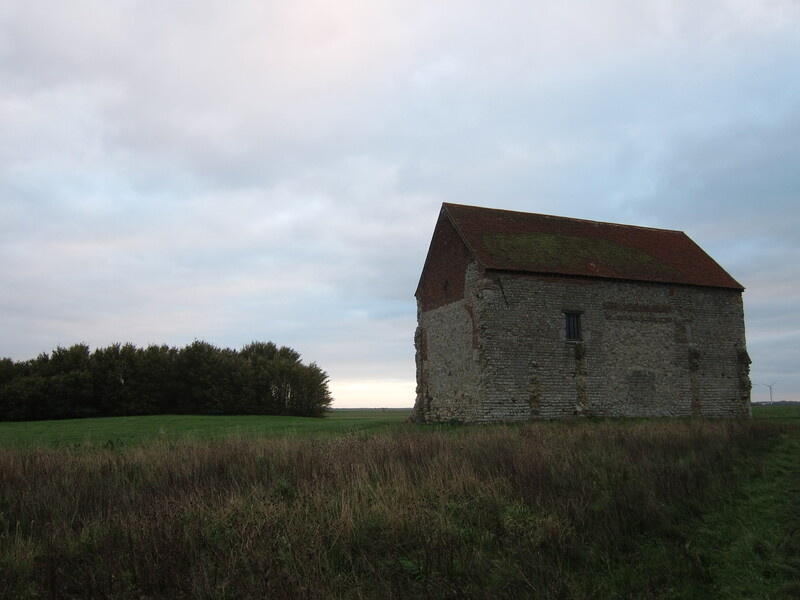 This is one of only 5 seventh century churches in England. Dating from the 650’s it was founded by St. Cedd, from Lindisfarne, so was a Celtic Christian church, rather than one of those founded by the new followers of the Roman Christian Augustine. It was built on the old Roman fort of Othona. The light on the marsh and on the sea was superb – cloudy to begin, then a couple of hours of bright sunshine, followed by black clouds inland contrasting with golden afternoon sunlight on the rustling reeds. I am very sorry to be hanging up my walking boots for six weeks or so, but I shall return in late January. I am pleased with progress for the year – 629 miles over 36 days: an average of 17.5 miles per day at a rate of about 2.3 miles per hour over all terrain. Congratulations Melita! Fantastic achievement and a lovely way to finish with that ancient chapel. I use to go sailing at Burnham but didn’t know about the chapel. I’d love to walk with you again but must acquire new boots first.